Two years on and another painting holiday in Italy with Arte Umbria. This time the course was run by the artist Caroline Bays. Arte Umbria is located in the mountains of Perugia not far from the village of Montegabbione. Sarah and David Moody make their guests very welcome, the food is fabulous, as only Italian food can be, and the sun shines…perfection. I had a great time previously with Arte Umbria, but since then I had stopped portrait painting and focused on improving my drawing skills. The hope was that if I ever returned to oil painting I would see some considerable improvements. So the course with Caroline was a good opportunity to assess if that work had paid off, and to have the benefit of her expert advice and tuition. The week’s course was split between painting the local landscape and portraiture. Painting ‘plein air’ was a first, but my focus was really the three days of portraiture. Normally I use just the three primaries, Alizarin Red, French Ultramarine, Cadmium Lemon and Titanium White, and I’ve found I can mix any colour from a combination of them. Caroline in addition recommended using Raw Umber for portraiture. I’d been thinking for a number of days how to approach this portrait and paint in a more painterly style, with little or no blending and more visible brush marks. The night before the start of the portrait I weirdly had a dream and the method just came to me…sounds mad I know, but I guess it’s the result of all that conscious thinking and when asleep the unconscious kicks in, processes the waking thoughts and comes up with the solution. Anyhow I tried it out and it seemed to work. The model was Laurie, who I had painted before and the first morning consisted of drawing him from life in charcoal. After lunch I drew Laurie’s outline with a fine brush using a single dark colour, thinly applied, making sure the composition worked on the canvas and the proportions were accurate. 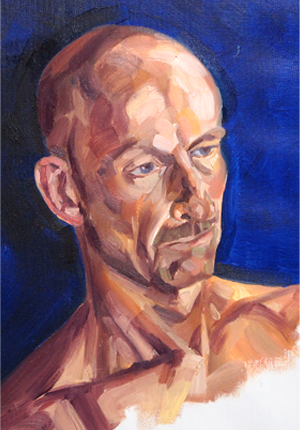 The next morning I spent the first 45 minutes mixing a range of colours that matched his flesh tones and then started blocking in the darker tones, gradually working towards the lighter ones. I kept the paint quite thick, just adding a little medium, making single brush marks following the contours of his face. I’d then wipe the brush and apply another colour again making a single mark and following the contours. I continuing like this for the rest of the day, until the figure was completely blocked in. Day two was a continuation of this process, building up the tonal balance and colour and this time using paint without any medium, so that the brush marks were well defined. And though the painting is not completely finished, I kind of like the incompleteness, it leaves something to the imagination. The process has convinced me to carry on oil painting and now back in the UK and I have thrown myself in the deep end by starting a 6×4′ painting for a group show, White Noise, at the Crypt Gallery, near St Pancras Station, London, 10-16 October. More of which in my next blog. Many thanks to Caroline and all at Arte Umbria for excellent tuition and great hospitality, I hope to be back in a couple of years.